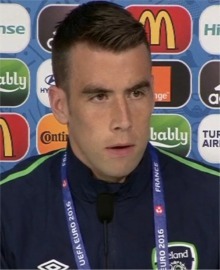 REPUBLIC of Ireland captain Seamus Coleman returned to a hero's welcome in his native Donegal last night. Hundreds of people from throughout the county thronged the streets of Killybegs to welcome Coleman home and acknowledge the Irish squad's strong performances in the UEFA Euro 2016 soccer tournament. Fresh on their minds was "the one that got away" against hosts France on Sunday and the brilliant, first-half performance from an Irish team that will live long in the nation's collective memory. Killybegs Community Council kept everyone up to date on social media with Coleman's estimated time of arrival after the team touched down at Dublin Airport earlier in the afternoon. The local man eventually arrived and was joined by wife Rachel as he carried their five-month old baby daughter Lilly through the streets led by the local marching band. He told the crowds he was "so proud to be from Killybegs, to be from Donegal". "I haven’t changed over the years, the same player, same determination from my Gaelic days to my soccer days," he said. And the popular Everton right back didn't disappoint the fans as he signed autographs into the early hours at the local Bayview Hotel.